Too Lazy To Make Your Own Twitter List? Let Conversationlist Do It For You. 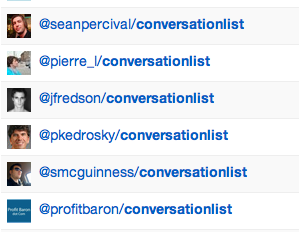 Did you get added to a bunch of Twitter lists today with the name “conversationlist”? If so, you’re not alone. No, it’s not a bug or a worm spreading through Twitter, it’s a new service that aims to create a Twitter list for you based on people you actually have conversations with on Twitter. 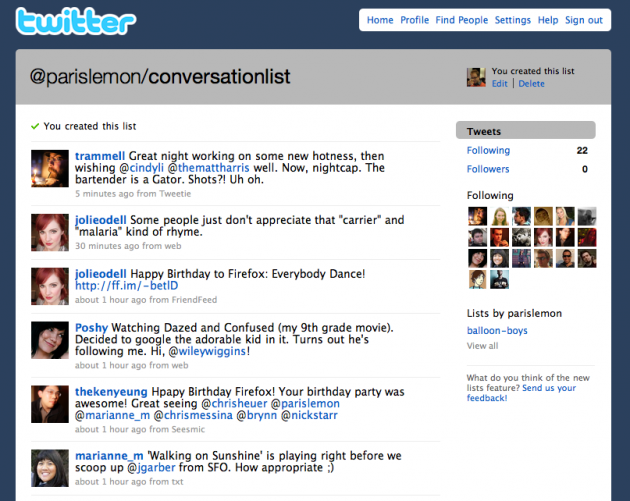 The idea is very simple: If you’ve @replied someone in the past day, Conversationlist will add them to your “conversationlist” Twitter list. But this person will only stay on that list as long as you keep talking to them. If the next day you don’t @reply them, they’re gone. That in and of itself is kind of an interesting way to keep track of people that you find interesting enough to want to directly talk to at any given time. But it gets more interesting when others start following your Conversationlist, because it gives them a glimpse of the people you actually talk to on Twitter. And if you’re the type of person who wants to try out Twitter lists but doesn’t want to take the time to make one, this is a pretty simple way to create one that could actually be useful. According to Conversationlist, there are only ever 25 people on the list they create for you at any given time. If you want to stop it from updating, simply delete the list on Twitter and Conversationlist will stop building it for you each day. To get it working, you only have to click one button on the Conversationlist site, authorize the service via OAuth, and you’re set. Super simple.